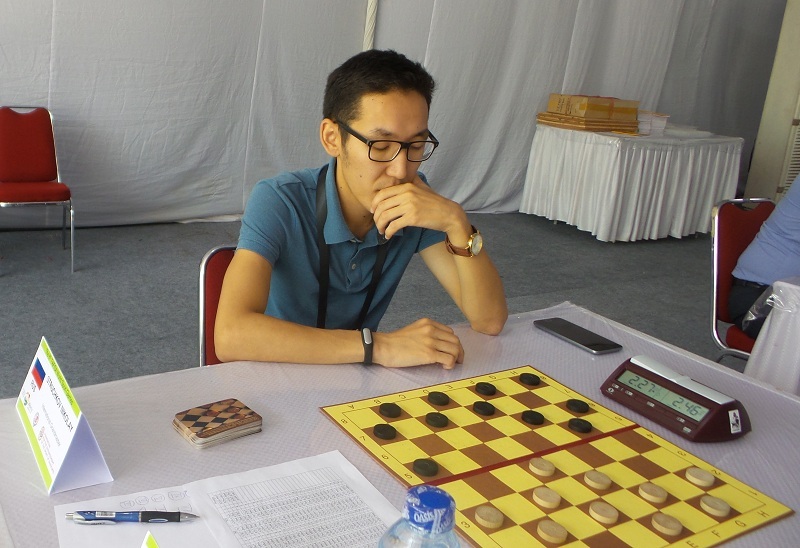 International Draughts Federation (IDF) according to the calendar of competitions 2016 holds in Jakarta (Indonesia) from 6 to 12 October 2016 International Draughts-64 Competition in the framework of the 6th TAFISA World Sport for all Games 2016. The competition is held with the support of the Foundation for Assistance of development of Draughts Sports “Russian Draughts”. 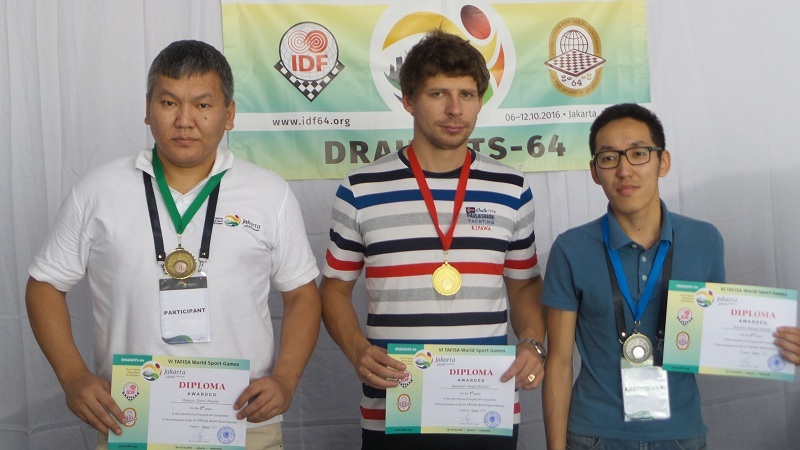 International Grandmaster Sergey Belosheev won Rapid programs in Russian draughts and in Brazilian draughts. 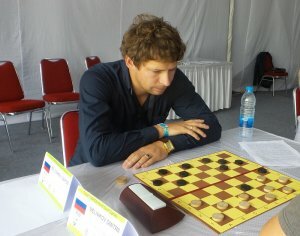 Nikolay Struchkov won Blitz. Competition will be held in Jakarta (Indonesia) from October 6 till October 12, 2016. Registration will be held October 5th and October 6th, 2016, from 07:00 AM – 05:00 PM. Departure of participants is October 12. All participants regardless of gender, age and rating are allowed to participate in the competition, who registered in accordance with this regulation and paid the tournament fee. Participants must to be on the closing ceremony of the competition, in breach of the item participants lose all official awards. Administrative arrangement of the 6th TAFISA World Sport for all Games 2016 published HERE and it is mandatory for all participants. Competitions in draughts-64 are held on the official rules of the IDF. System of each competition is Swiss or round robin, depending on the number of participants. All programs will be held by the system of micro-matches consist of two games with the drawing according to the official table. Places of players are determined by the biggest amounts of points. In case of equal points of two or more participants the additional criteria are established by the panel of judges according to the system of the competition. All costs of participants paid by sending organizations or themselves. The costs for organizing the competition and paid by the International Draughts Federation and Organizing Committee. Each participant before the start of competition should pay the tournament fee 100 US $. Fee gives the right to participate in all three programs. Tournament fees may to be transferred to the account of the International Draughts Federation no later than September 26 or pay in cash October 6. In case of bank transfer payment receipt should be sent to the office of the International Federation before the event. Hospitality desk in each selected partner hotel. Applications for participation must be submitted to the office of International Draughts Federation not later than August 15 on e-mail: [email protected], [email protected]. To the application shall be attached scans of passports of all participants and accompanying persons. Applications for obtaining visas (up to August 15) and booking accommodation (up to August 26) must be submitted to Langina Antonina, e-mail: [email protected], [email protected]. 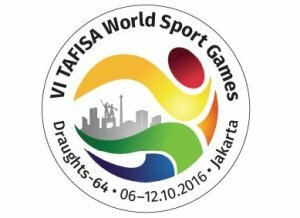 15-10-2016 VI TAFISA World Sports Games completed. 12000 athletes from 87 countries in 62 sports participated in the competition. The competition was held under the patronage of the IOC, TAFISA and UNESCO. 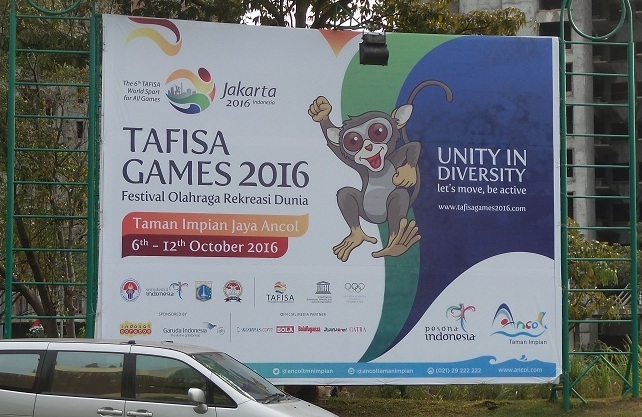 At the opening ceremony, which took place on October 8 at the famous Anchol Park, World Sports Games opened Indonesian President Joko Widodo, the participants welcomed the President of TAFISA, a representative of the IOC and other officials. Draughts-64 the first time was present in this global world sports forum. 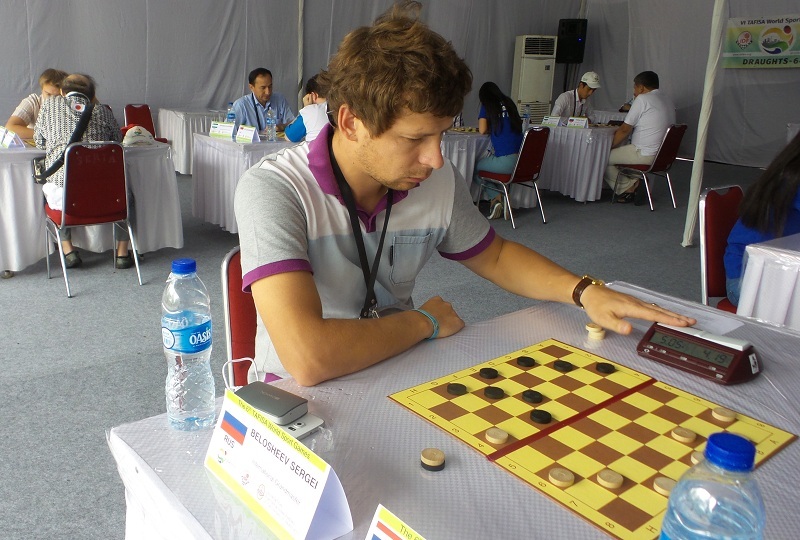 3 programs of competitions in draughts-64 (Russian and Brazilian version) was held from 7 to 9 October. 10 and 11 October representatives of our delegation participated in various activities of the TAFISA World Games. 11 October evening was held the official closing of the games. It is worth noting the excellent organization of the games. Each organization had its own officer, who promptly solved all problems, as well as a bus for the transfer to the venue, other activities and at the airport. 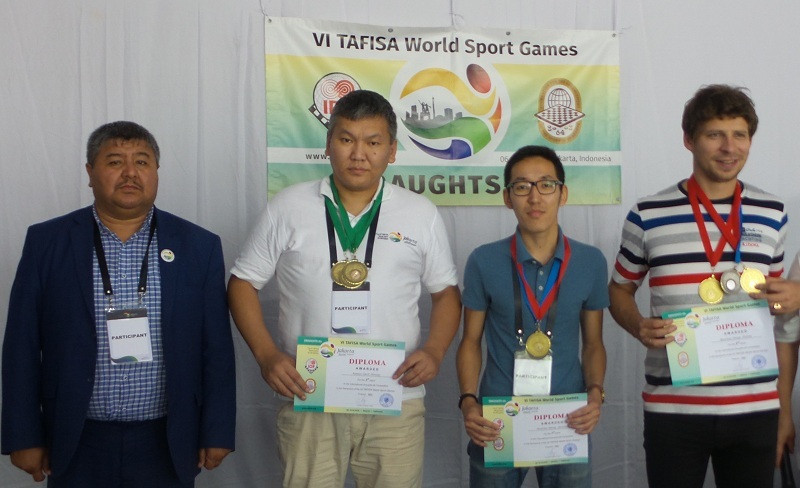 All participants except for official awards and prizes from the IDF (the prize fund was of US $ 15,000), received gifts, souvenirs and certificates from the organizers of the TAFISA World Games. 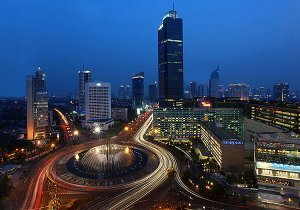 Goodbye Jakarta! The next VII TAFISA World Sport Games will be held in Lisbon (Portugal) in 2020. 09-10-2016 Blitz program in Russian draughts is held today. Confident game throughout the tournament showed ex-world champion Nikolay Struchkov. The victory in the 5th round over current world champion Sergey Belosheev become a serious application for the title of champion in blitz program. After 7 rounds of the preliminary stage the best 4 players are: Struchkov Nikolay, Belosheev Sergey, Kolesov Gavril and Dudco Denis. They will compete for medals in the semi-finals and finals. 08-10-2016 Rapid program in Brazilian draughts is held today. Like the previous program, competitions are held in two stages, first holds a preliminary stage on the Swiss system in 7 rounds. Then the best 4 players in the semi-finals and finals will fight for the medals. See current results. Preliminary stage completed. Like the previous program, best 4 players – Belosheev Sergey, Struchkov Nikolay, Kolesov Gavril and Gulyaev Nikolay will compete for medals in the semi-finals and finals. 07-10-2016 Rapid program in Russian draughts srtarted today at 10:00 a.m. Competitions are held on the Swiss system in 7 rounds. Top 4 players in the semi-finals and finals will reveal the winner and the prize-winners. Preliminary stage completed. Belosheev Sergey, Struchkov Nikolay, Kolesov Gavril and Gulyaev Nikolay will compete for medals in the semi-finals and finals. 06-10-2016 VI TAFISA World Sports Games start today. 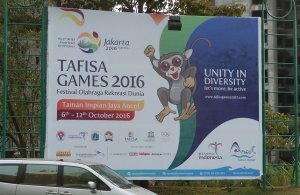 Total in the Games will participate more than 12 000 participants from 110 Member 0f TAFISA. 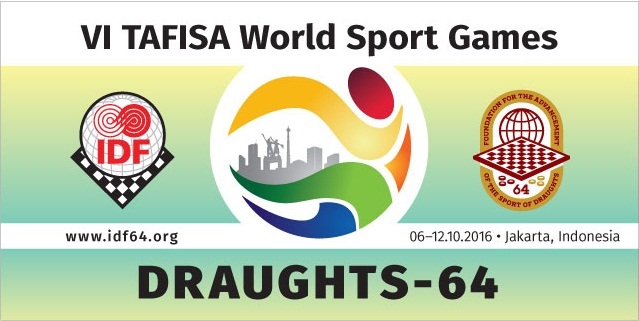 Draughts-64 will be presented for the first time in this prestigious international forum. As part of the competition will be held three tournaments in Russian and Brazilian version of draughts-64. 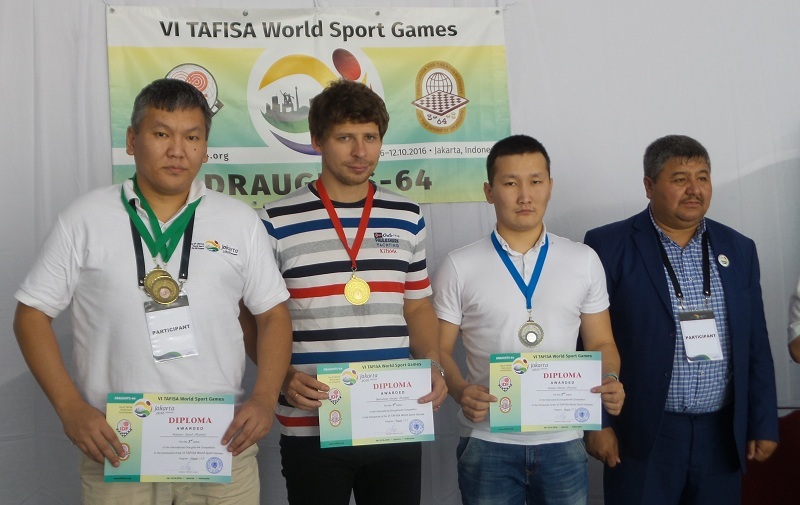 The strongest players of the world took part in competitions: the current world champion Sergey Belosheev, world champions in different years – the legendary Gavril Kolesov, Nikolai Struchkov, Zhanna Sarshaeva; bronze medalist of the World Championship 2015 Nikolay Gulyaev, Asian champions Samandar Kalanov and Alisher Artikov, winners of World Cup 2015 among women and juniors Ekaterina Ivanova and Dmitry Melnikov, the winner of World and European championships among youth, winner of the stage of the World Cup 2015, a multiple champion of Moldova Denis Dudko, strongest players from Latvia, Malta, Bulgaria, Singapure, Thailand and Japan. Prize fund of competitions is 15 000 USD. All participants will receive money prizes.